What is Aircraft Maintenance Engineering? 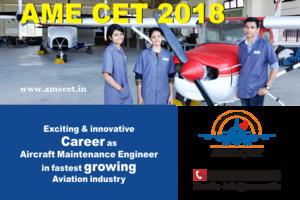 Aircraft Maintenance Engineering (AME) is three year license course in aviation and this course is approved by Directorate General of Civil Aviation (DGCA), Govt. of India and Ministry of India. In aviation Aircraft Maintenance Engineering (AME) is one of the best course and it is very interesting and exciting career in them. Aircraft Maintenance Engineering (AME) is responsible for the safety, security and maintenance of an aircraft. They also are eligible to authorize to issue the Flight Relising Certificate (FRC) when the flight is going to takeoff.